It was a Dwadeshi when we came to Mantralaya. Our first halt was to the temple of Raghavendra Swamy. We spent a amount of considerable time there. Since we wanted the Mrithike of Raghavendra Swamy Brindavana, we walked to Mantralaya village which is cluster of small houses and vatara (group of houses). The village is located right behind the Brindavana Guest house which is perpendicular to the matha. To get to the village walk along the path to the Tungabhadra river. Once you reach the cluster of shops, take a right and you will find yourself lost in a small village with mud and thatched houses. Follow there small road and you will come to the temple of Venkataramanaswamy. This temple is an important landmark in Mantralaya. 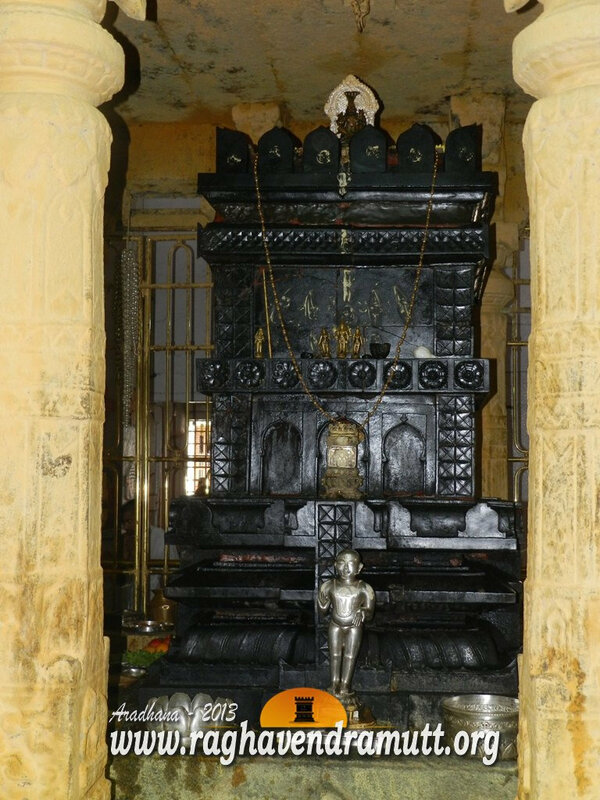 The idol of Venkataramanaswamy was consecrated by Raghavendra Swamy himself just before he entered brindavana. Rayaru or Raghavendra Swamy spent many years in Mantralaya and Bichale. He entrusted the job of constructing the temple to Dewan Venkanna, who was an official in the court og Nawab Siddi Masud Khan. Initially, Siddi Masud Khan was only a Governor of Adoni which came under the Adil Shahis of Bijapur. After the fall of the Vijayanagar Kingdom in 1565, Bijapur emerged as the most powerful kingdom of South India. Its empire extended from coast to coast and it included parts of Andhra Pradesh (Adoni and surrounding areas), Karnataka, Tamil Nadu, Maharashtra and even Goa. Siddi Masud Khan was one of the Governors of Adoni. The Adil Shah Emperor, appreciated the services of Masud Khan, and chose him as the Prime Minister. However, Masud Khan found the atmosphere in Bijapur, the capital of the Adil Shahis, stifling. There was politics between the Afghan nobles and the Siddis. Masud Khan resigned from the post and came back to Adoni. Subsequently, he declared himself as an independent ruler of Adoni. He made Dewan Venkanna the prime minister. Both Venkanna and Masud Khan looked after the comforts of Rayaru at Mantralaya. When Rayaru asked Venkanna to monitor the construction of the Venkataramana temple in Mantralaya, Venkanna did so without any hesitation. Rayaru stayed in Mantralaya village for years. I could not find much time to trace the house where he stayed but I was told by several local priests of Mantralaya and even the priest worshipping the Brindavana of Vadeendra Theertha in the Moola Brindavana Sannidhi of Mantralaya, that Rayaru stayed for some time in the Venkataramana Temple. Though many of the houses in the village of Mantralaya are old, not many of them can be dated to the period of Raghavendra Swamy (1659-1671). I take this period as Rayaru is reckoned to have come to Mantralaya-Bichale-Adoni around 1659 after completing his triumphant Theertha Yatre where he defeated several Adwaitha scholars and established the supremacy of Madhwa Siddantha. It is believed that Rayaru commenced construction of the Venkataramanaswamy temple only after he got the nod from Goddess Manchalamma to construct his Brindavana at Mantralaya. ﻿﻿﻿﻿ As Manchalamma was the Grama Devethe (Goddess of the area), Rayaru had to obtain her permission which she gladly gave. The idol of Venkataramanaswamy is small but beautiful. The temple is called Sri Tirumala Srinivasa Devaru and the idol here is the Kula Devetha of Rayaru. This is one of the few idols that Rayaru consecrated in his entire life. The other idols he consecrated were of Hanuman in front of his Brindavana and another idol of Hanuman in Hattebegall in Andhra Pradesh. More importantly, Rayaru had stayed at the very place where the Venkataramanaswamy temple exists. He took personal interest in its construction and also performed pooje to the lord. During the period of the construction of the temple, Venkanna decided to give a facelift to Mantralaya which then was a hamlet of few people with the name Manta Saale. He invited saints, scholars and Brahmins to stay in the place and provided them with all facilities. Venkanna visited the village twice a week and personally noted the construction of the temple. He chose an elevated place to set up the village and the temple too came up there. He thought that the waters of the Tungabhadra would not flood the elevated place but he was proved wrong when the flood waters of the Tungabhadra entered the village, matha and even the temple in October 2009. Today, of the lakhs who throng to Mantralaya, only a handful make it to the Venkataramanaswamy Temple. It is a gem hidden in the midst of a village-a deity dear to our Rayaru. All the three photos are of the Venkataramanaswamy Temple.